**Many thanks to NetGalley, Berkley Publishing, and the author for the opportunity to read a free ARC of this book in exchange for my honest review. Think about where you’ll be — where your daughters will be — when the courts turn back the clock… Think about waking up one morning and finding you don’t have a voice in anything. In addition, Dalcher also uses the flashback method (as Atwood did with Handmaid) to take us back to life before the new government created this new “Pure movement”. Dalcher doesn’t shy away from the Atwood association though, and she lists her as a literary influence on Goodreads (along with Shirley Jackson and Stephen King). So, there! 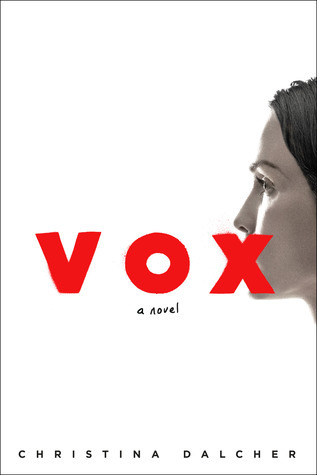 Ok, so the two books are a lot alike; HOWEVER, there are also some key differences that made me view The Handmaid as scary but empowering, and Vox – not so much. Monsters aren’t born, ever. They’re made, piece by piece and limb by limb, artificial creations of madmen who, like the misguided Frankenstein, always think they know better. So here’s the plot summary: Dr. Jean McClellan used to be one of the foremost neurolinguistic scientists in the United States. Past tense, because ever since the new president took office and set up the loquacious Reverend Carl Corbin as a White House advisor, women aren’t allowed to speak, let alone work as scientists – or anything – anymore. Women have been stripped of their careers outside of the home, all their bank accounts, cell phones, laptops, access to birth control, and – most invasively – their voices. According to the new government, the female population is only allowed 100 words a day. Any more than this and a band on their wrists administers a painful electric shock that increases in intensity with every additional word. The ultimate goal is to force women back into “more traditional” roles within the home: cooking, cleaning, and raising families – whether they want to or not. Jean inwardly rails against the establishment, but she does so silently, until the day an opportunity presents itself that may offer a way for her and her daughter to buck the system and get to speak again. But will the cost be too heavy a price to pay? And is her husband truly being supportive or just secretive? OK, so I’ll review first and rant later. This is a hard review to write. I have to separate how I feel about the subject matter from how I feel about the writing/plot development/characters/etc., and if you’ve ever reviewed any type of controversial book before, you know that is not an easy thing to do. As dystopian novels go, this one was packed full of frustrating circumstances, despair, oppression, and all the negative emotions you can imagine a dystopian novel would contain. No, all the characters aren’t likable (even, surprisingly, the main character), and most of them aren’t given a whole lot of backstory, so don’t expect a lot of character development here. It’s a quick read and most of the true action is stuffed into the final few chapters. But the premise is extremely compelling and it does draw you into the story easily. I did read this mostly in one sitting because I was so interested to see how it all played out in the end. Vox certainly serves as a cautionary tale reminding us that evil ideas prevail when good people do nothing – especially when we don’t go out and vote! You know that totally “woke” friend who is always pushing everyone to call their congresspeople and to oppose this cause and that cause? Listen to her. If nothing else, this book taught me that much. Did I love it? No. Was it worth a read? Sure. Of course, there are plot points that are infuriating and potentially dangerous in the wrong hands, but isn’t that almost a requirement for good dystopian fiction? This book made me angry, sad, frustrated and – at times confused, but I left it knowing that someone’s words caused all those feelings in me, and isn’t that kind of the point of reading? I wonder what the other women do. How they cope. Do they still find something to enjoy? Do they love their husbands in the same way? Do they hate them, just a little bit? Now for the rant – and, don’t worry, I’ll keep it short. I’ll just put it right out there: I’m a Christian. I NEVER push my beliefs down anyone’s throat nor do I devalue anyone else’s faith. So, it was VERY painful to read this book and see all the many, many, many times the main character maligned Christianity as a religion and its followers as a whole. There was no separation of “these certain religious fanatics” or “a specific group of extremists”. No. It was the entire religion and everyone who believes in it. That made me angry and it separated me from the story. I couldn’t relate to the characters, who were obviously suffering and deserved my sympathy, because of that gross and blatant injustice. And I’m personally astounded by all the times Christianity is portrayed as the villain in mainstream media without anyone condemning that practice. We will defend the rights of Islamic Muslims to not be categorized as terrorists and the rights of Catholic men to not be pigeonholed as pedophiles, etc., but with Christians, hey! it’s free game! I take issue with that. You obviously don’t need to be told that all Christians are not extremists. All Christians are not judgmental separatists who dream of a controlled society where diversity is non-existent. Most Christians are just hardworking, God-loving people who are just trying to live good, compassionate, charitable lives. To lump us all with the images of a few power-hungry radical individuals was a gross misrepresentation, and I take exception to that. OK, rant over. But know, that while I did harbor that resentment throughout the book, I did not rate the book based on my personal feelings about the subject matter. And I’m not attacking the author either for the opinions of her main character! Phew, I feel better getting that out of my system! According to my personal rating scale, I gave Vox 3 stars: “This book was alright. Might be worth reading for most, but there are several things about it that will keep me from recommending it to all.” Three stars is not necessarily a bad rating from me. Lots of what I read ends up in this category. It was a solid book and will appeal to a vast majority of readers. If you pick this one up, here’s my two-cent advice: Read it for what it is, try hard not to compare it to other stories, and find at least one character you can relate to. Good luck! Excellent, thorough review Tiffany. I’m awaiting this book in the mail, and you’ve helped me to prepare for it, especially with regard to the Christian opposition part. I haven’t read The Handmaid’s Tale, so I won’t have it to compare this book to. I think the premise is intriguing, so that’s what prompted me to request it. So…we shall see what I think. I think you are at a distinct advantage for not having read Handmaid already. That way the glaring similarities won’t distract you from Dalcher’s story. I really hope you think better of it than I did!